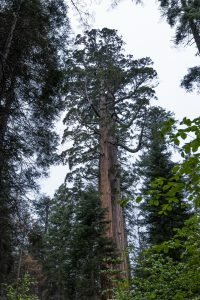 Explore the lower section of Yosemite’s largest grove of Giant Sequoias including the famous Grizzly Giant. The National Park Service just finished renovating the Mariposa Grove to make the area quieter, and a more natural and healthier environment for these impressive giants. This network of trails travels through the cathedral of ancient trees in this section. Interpretive signs tell the stories of these trees and wetlands that make up this wonderful habitat. Continue on exploring the rest of the grove by hiking up to the Upper Section of the Mariposa Grove (see Upper & Lower Mariposa Grove).